Our plant pots are made by high-temperature burned ceramic Don’t worry about it will be broken easily. It is reall perfect for holding succulent, herbs and catus plants, and when placed together, make a beautiful display. Design with a hole on the button to increase the breathability and permeability of plants and prevent water accumulation in the basin. Perfect home&garden decoration, even for wedding. Ideal gift for Housewarming, Birthday, Valentine's Day, Mother’s Day and Christmas’s Day. 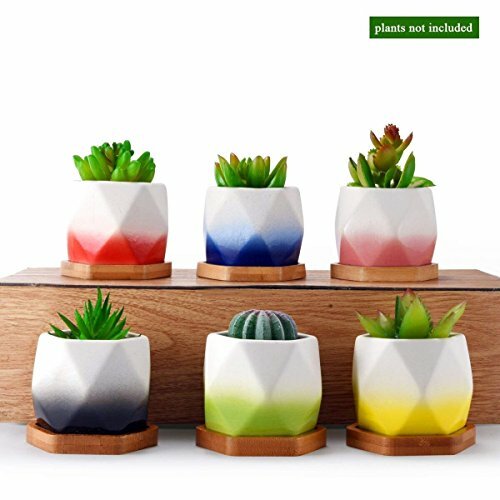 【Unique Geometric Design】Hexagon shape pots and bamboo trays,Modern gradient color glaze with 6 color:red,green,blue,black,pink,yellow. Sturdy and durable material by using high temperature burned ceramic. 【Great Decoration & Gift】Suitable for indoor and outdoor,adorable decor for your windowsill,desktop,kitchen,bathroom,office,bedroom,garden or anywhere you want.it also the great gift for your kids'birthday&Mother's day Christmas present,friends or family. 【Drainage Hole and Colorful Stones】The succulent pots are designed with a small hole on the bottom. Come with colorful stones will make them more artistic and distinctive.